For this project, we were interested in gaining a better understanding of women's lives in the Adirondacks during the 19th century, which is a subject that our readings did not thoroughly cover, but is nevertheless essential in gaining a more complete understanding of Adirondack history. 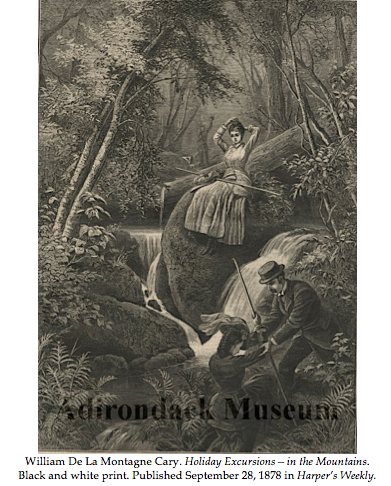 We were inspired by a trip to the Adirondack Museum in Blue Mountain Lake in which we saw several Harper's Weekly prints depicting women engaged in various activites in the Adirondacks whether it be cooking or hunting. Art is an incredibly valuable resource when conducting any research, and it certainly proved to be significant for our own purposes in examining women's experiences in the Adirondacks in the 1800's. Out of the paintings and prints that the Adirondack Museum has in its collection, there are several common roles that artists frequently depicted women emodying. Firstly, women are largely represented in relation to domestic interiors and homesteads. In these domestic scenes, artists commonly illustrated mother figures invovled with daily activities such as cooking, often in very rustic settings. In stark contrast to domestic scenes, artists also frequently depicted women partaking in recreational activities in the Adirondacks. Scenes of women fishing and hunting appeared in several of the prints and paintings we examined. In addition, women hiking and climbing mountains also proved to be an interesting subject matter for several artists. By examining several paintings and prints within the context of 19th century literary accounts of Adirondack life, we can gain a better understanding of the various experiences and expectations of women in the Adirondacks in the 1800's. Along with examining these various depictions of women in Adirondack paintings of the 19th century, we explored the Adirondack works of Edna West Teall and Georgia O’Keefe. In doing so, we departed from the notion of women as subject matter and instead examined the theme of the woman as artist. This shift in focus allowed us to contemplate women's active roles as artists after first coming to understand the more typical standard of women’s presence in Adirondack art. Through our project, we hope to offer a more complete understanding of early Adirondack history through exploring women's experiences as represented in the medium of art.